Well, let's see...I have a passion for being creative, either with a needle and thread or a skein of yarn, in the kitchen, or, in the backyard... It gives me great comfort and satisfaction to see the end result. You know, that "look what I accomplished" feeling. I absolutely LOVE to take a piece of material or a skein of yarn and turn it into something special. Sewing or crocheting - for family, friends and once in a while for myself, is something that I really enjoy. I also love to cook and bake. And I collect recipes. Lots and lots of recipes. I try to see just how creative I can be to hide veggies in a dish for my "green beans and carrots only" loving husband. And flowers, I LOVE flowers!!! Pots of flowers abound (occasionally) in my backyard, and, as long as I don't get too busy sewing or crocheting or cooking and forget all about watering them,( nope, that NEVER happens...sigh...), they overflow in splendid, colorful beauty. 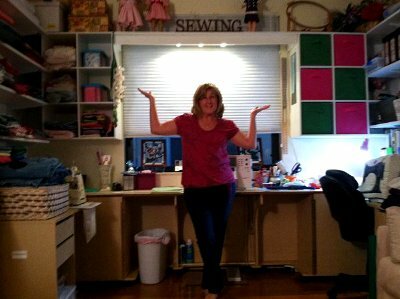 This past year my best friend, ie: the Hubby, helped me create what we now call "The Woman Cave", my own little corner of our home that I can stash my yarns, fabrics, patterns and all my cool "tools" that help me turn all that yarn and fabric, with the help of the patterns, into cool things. 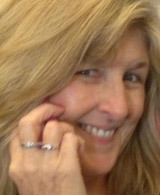 Hope you stop by often, and if you are so inclined, feel free to leave a comment or two. This is my "cave", where I spend my days (and sometimes evenings) doing "my thing" as the Hubby calls it. I'm so organized now! 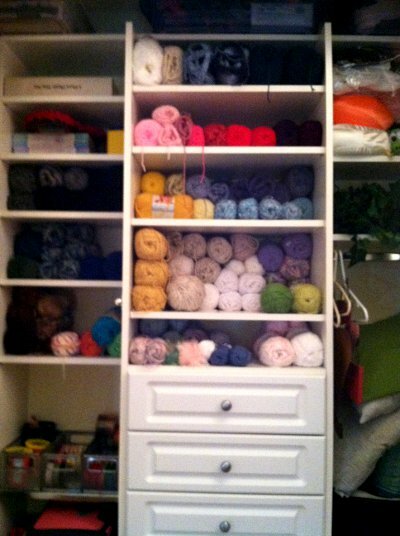 and this is the yarn stash!